Serving a spiral ham makes a gorgeous impression for a special occasion but it's also an expensive splurge. 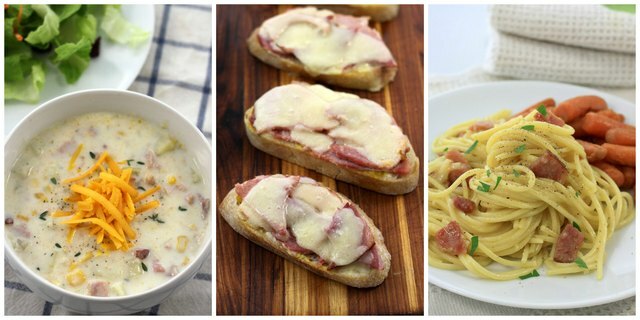 Offset that initial cost by transforming the leftovers into three totally different meals, complete with a simple side dish--all for less than $15 each. Minus the cost of ham and small amounts of basic pantry supplies, a family of four will be eating well for the same price as a round of lattes. Melt butter in a large stock pot, then sauté onions and garlic until soft, about 5 minutes. Add flour, stirring for about 30 seconds before slowly pouring in the milk. Combine the potatoes, ham, thyme, salt and pepper; bring to a boil then lower heat. 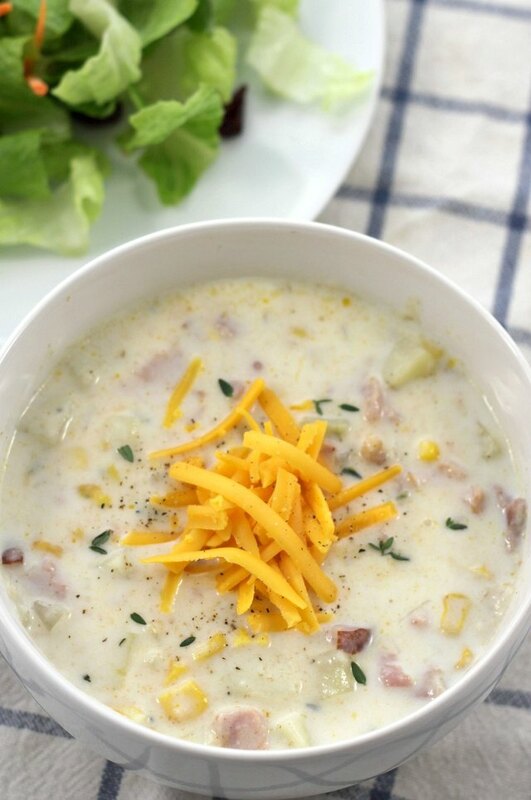 Simmer for about 30 minutes until potatoes are soft, and the soup is thick and creamy. Serve with cheddar cheese on top. Pour your salad greens into the bowl you plan to serve it in. Add the zest and juice of one lemon plus a generous drizzle of olive oil (about 3 tablespoons) and enough salt and pepper to taste (about 1/2 teaspoon salt and 1/4 teaspoon pepper). Toss and serve. Preheat your broiler to high. Place four to six slices of bread on a baking sheet. Mix the mayonnaise and Dijon mustard in a small bowl, then slather the mixture on top of each piece of bread. 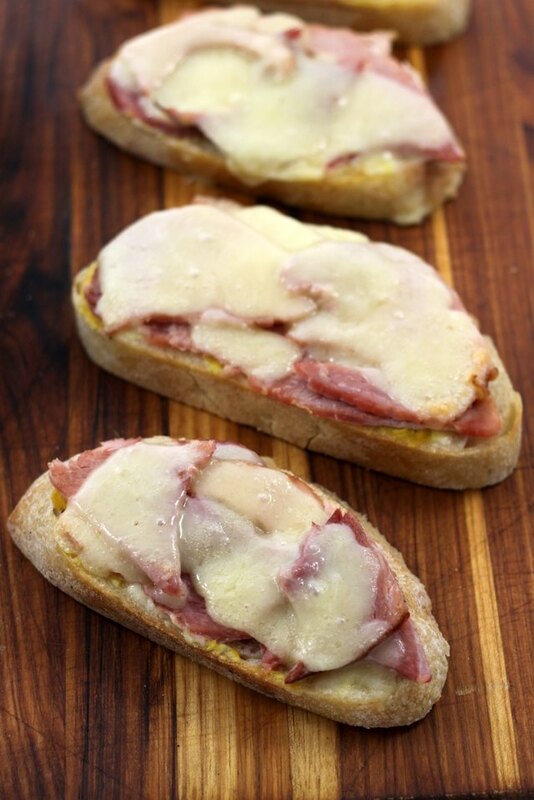 Follow with enough ham to cover the bread to the edges and top with sliced cheese. Broil for 2 minutes, or until the tops are golden and bubbly. Putting down a layer of parchment paper to catch any melted cheese makes for instant cleanup. Heat the olive oil in a large stock pan. Add the onions and cook until soft, about 5 minutes. Pour in the frozen broccoli, chicken stock, salt and pepper. Bring to a boil then simmer for about 10 minutes until the broccoli is soft. Puree with a handheld emersion blender before stirring in the cheddar cheese. Put a large pot of water on to boil and cook the pasta according to package instructions, minus 1 minute of cooking time. 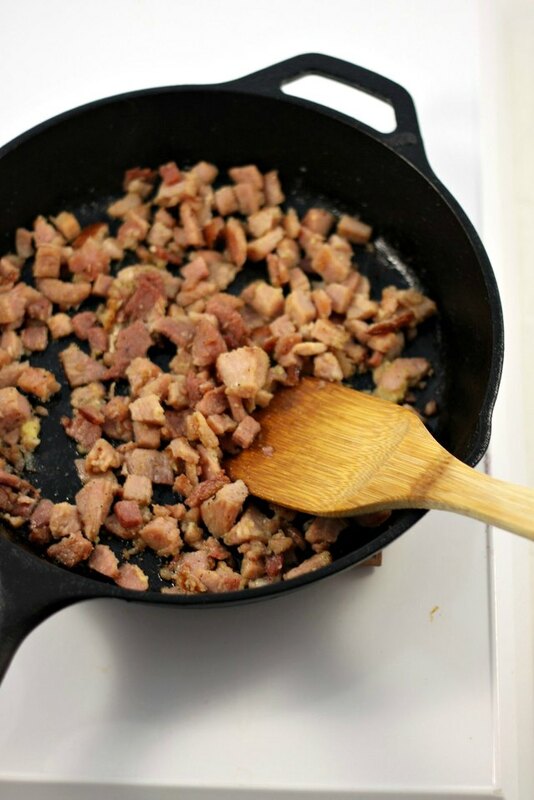 While the pasta cooks, use a large skillet to brown the ham in olive oil. Drain the pasta when it's ready, reserving one cup of cooking water. Move quickly to combine the eggs with the hot pasta, stirring as you also add the mustard and cheese. Sprinkle the salt and pepper on top, then finish with a dash of freshly julienned parsley. 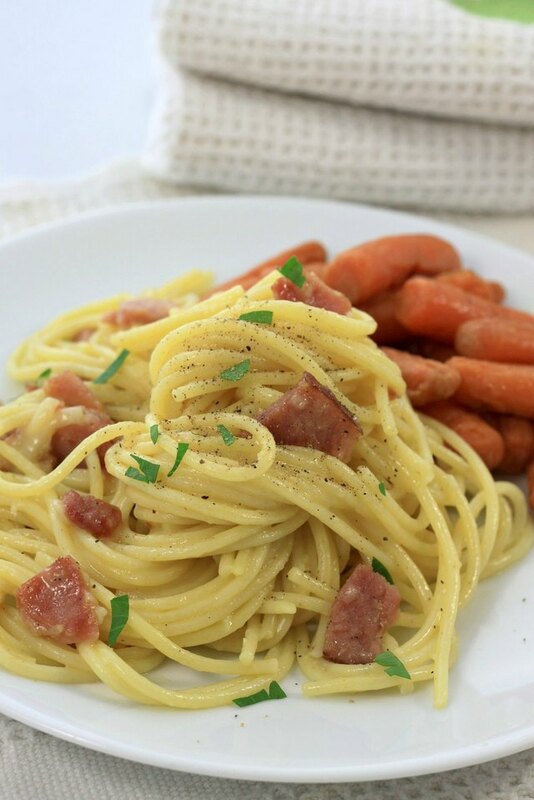 Since traditional carbonara is made with bacon and you're substituting ham, add 3 tablespoons of olive oil to a pan before cooking the ham until the edges are crispy. This step will bring additional flavor and moisture to the final dish. Preheat the oven to 400 degrees Fahrenheit. Pour the entire bag of carrots onto a baking sheet, slather with olive oil (and maple syrup if using) and sprinkle with salt. Roast for about 20 minutes until the carrots are soft on the inside and starting caramelize on the outside.